The image shows a resistance spot welding process: A wheel house is joined by five spot welds. The shown result value is the peak temperature. 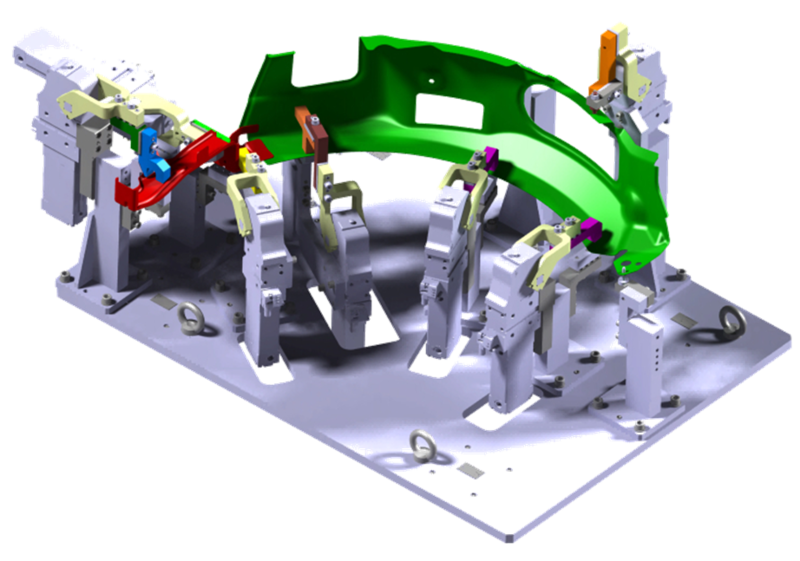 For a given assembly there are still numerous process parameters that influence the final product quality after welding. For a defined welding process, including planned welding sequence as well as clamping and unclamping, Simufact Welding provides the possibility to calculate expected distortions, stresses and material properties after welding. Furthermore, the software allows for estimating the effects of tack welds on expected gap formation during and after welding. Especially calculation of stresses and material properties is a big advantage of the simulation because those are result values that are difficult to measure on real components. The process itself (i.e. the welding sequence) can easily be changed in the model, providing a quick possibility to investigate its influence on distortions and properties of the welded assembly. Furthermore, it is possible to change the position, applied forces and unclamping times in order to calculate the influence of clamping tools on final results. The overall benefit lies in the virtual try-out of different process settings and the estimation of their influence on the final product quality without the need to do it under laboratory conditions.